Catering to families and avid outdoor adventurists, the incredible Sierra at Tahoe ski resort is a treasure trove of award-winning terrain parks, amazing family adventures, one-of-a-kind runs through old-growth forests, and some of Lake Tahoe’s best beginner terrain. Snowboarders and skiers alike will find it to be one of the finest resorts in Lake Tahoe. It is no surprise that Sierra at Tahoe has been recognized by TransWorld SNOWboarding as a Top 10 Overall Resort year after year, most recently in their 2012 Resort Poll. A Sierra-at-Tahoe season pass is your ticket to 2,000 acres of fresh powder, 14 lifts, and 46 trails peaking at an elevation of 8,852 feet with a 2,212 vertical rise. Its five award-winning terrain parks include the South Shore’s only Superpipe. 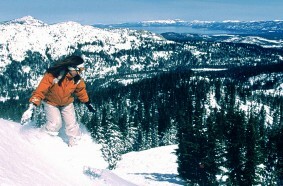 Sierra at Tahoe also offers the chance to ski and snowboard in one of Tahoe’s only remaining old-growth forests. There are also three miles of snowshoe trails. The resort is more sheltered from the wind than other Lake Tahoe resorts, so even on the windiest of days, the lifts are up and running. Even so, the Sierra at Tahoe web cams are your guide to the best powder on the mountain. Extremely challenging and appropriate for experts only, Huckleberry Gates features steep terrain filled with gut-wrenching cliff drops, rock chutes, open blows, cornices, glades, and powder pillows. Locals call it the best and most accessible backcountry terrain in Lake Tahoe. Huckleberry Canyon can be explored by qualified riders in two ways: with guides, or via a guided snowcat tour. This is a true family-oriented destination that has a special area designed specifically for the smallest skiers and snowboarders. Sierra at Tahoe’s Adventure Zones feature a variety of terrain, including mini jumps, rollers and banked turns. The Bear Cave, Gold Rush, Pony Express, and Teepee Town are areas with interactive activities to teach kids about local animals and a little bit of history, while helping them improve their skills. There are also tubing hills with two lifts and a snowplay area. If you need a safe place to leave little ones so you can hit the big slopes, the CA licensed daycare offers a fun and secure environment. After a day on the slopes, satisfy your appetite at one of eight food outlets that serve anything from fresh salads and wraps to juicy burgers, Southern-style barbeque, and thick delicious chili. There are also six bars including the famous Tiki Bar, which serves the Fishbowl. Sierra at Tahoe Ski Resort is easy to get to, being the closest major ski resort to Sacramento, and just 12 miles west of Lake Tahoe itself. It is only 72 miles from the Reno/Tahoe International Airport, and 187 miles from San Francisco International Airport. Start the season off right at Sierra at Tahoe ski resort. Conquer these other great Lake Tahoe ski resorts while vacationing in Lake Tahoe. Our Lake Tahoe ski resorts map lists all the resorts and their Lake Tahoe locations.